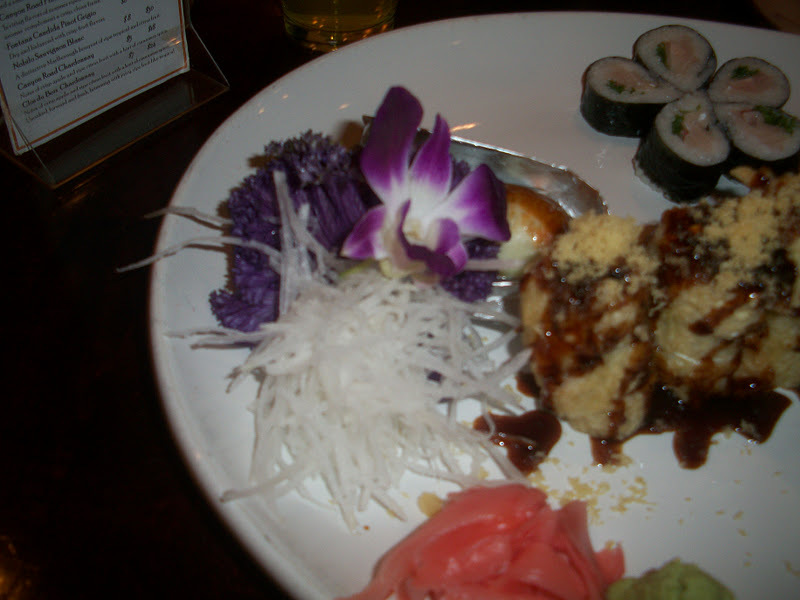 At our favorite sushi restaurant, we had a fabulous dinner tonight. We started with an appetizer of steamed gyoza. Every plate they serve has a different presentation. Once our sushi came in the shape of a bird. We have seen some orders delivered on a boat, or a bridge. This time it was kind of in a flower shape. 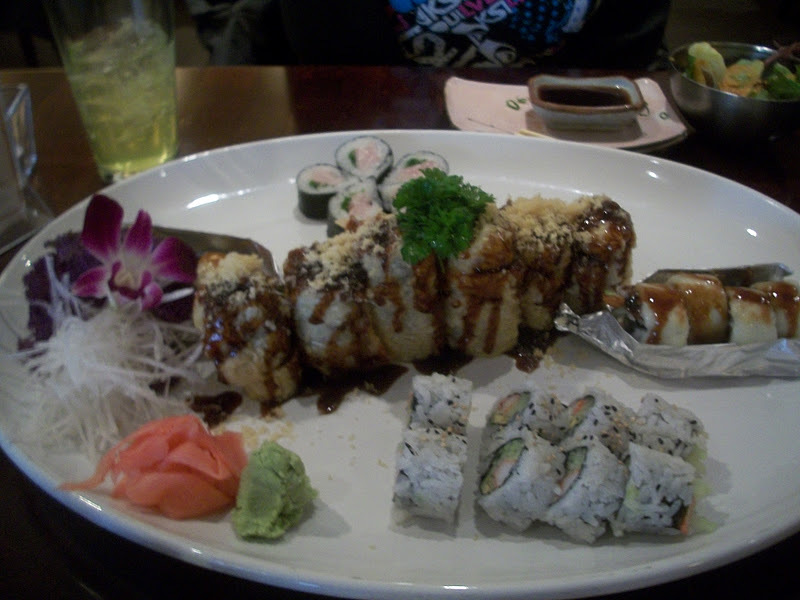 The middle was a double serving of a MSU roll. It don't remember what all is in it, but it is one of our favorites. 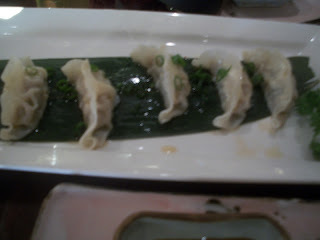 There is a cream cheese filling, and eel sauce that makes it sweet. Sweet and cheesy, the best combination EVER! The roll in the foil is called the snowman, it too is extremely delicious. It has a little bit of shrimp in the middle and the roll itself has mozzarella cheese on the outside. Again on of our very favorites. Directly in front is a California roll and on the far side a yellow tail roll. My daughter brought along a friend who wasn't sure what types of sushi she would like. She ended up liking them all. 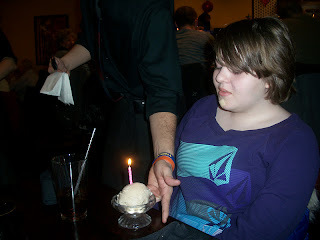 The entire restaurant sang Happy Birthday as a bowl of ice cream was brought out. She had the choice between ginger, green tea and vanilla. 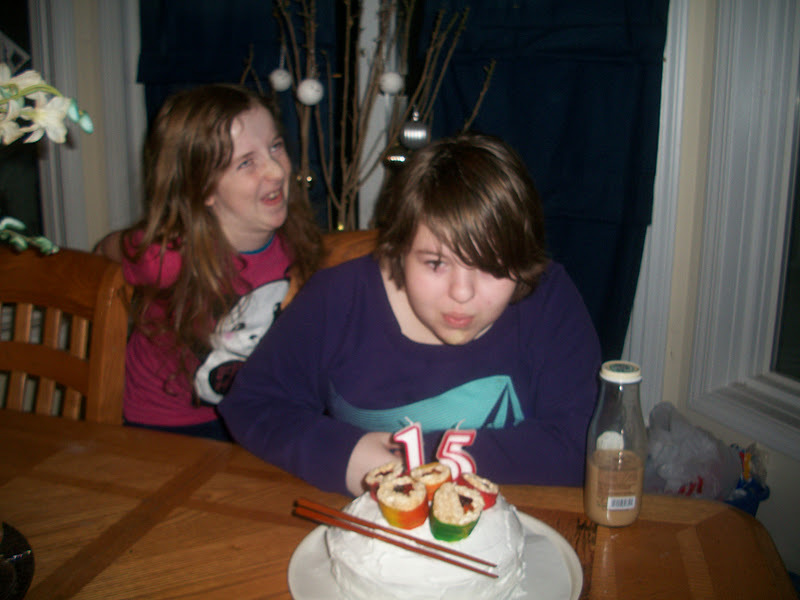 When we got home I served her sushi cake. I thought you might see the 15 a little better, but I guess I put a few too many sushi rolls on top. LOL! She didn't mind, she really liked the candy sushi and so did her friend. When it was time to blow the candles out, the lighter we normally use for candles no longer worked. She agreed to fake it, so it looked like she blew her candles out. I am not too thrilled with Kara making a crazy face in background, but it is my only candle pic. Silly kid! I LOVE the theme!!! 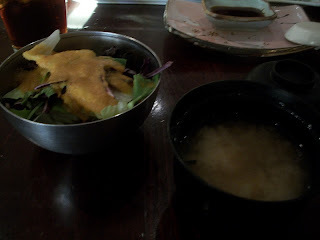 Everything from the restaurant looked so good. I love how they make their food so pretty on the plate. The dessert you made at home was so cute. 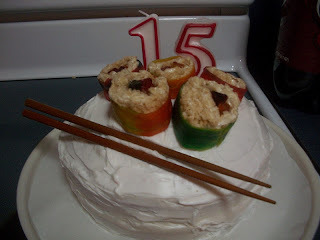 I think I want a sushi themed birthday now too :) Happy Birthday Kristina!